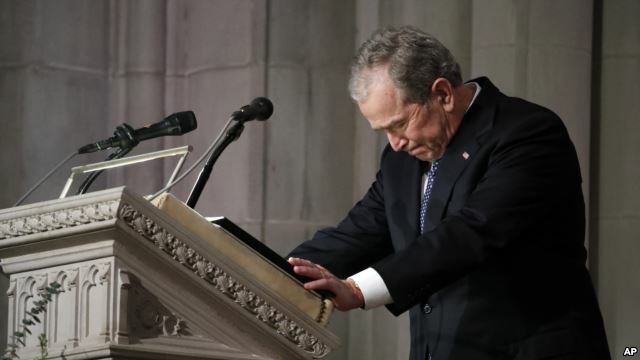 Editor's Note: Former President George W. Bush, America's 43rd president, delivered an eulogy to his father, George H.W. Bush, the country's 41st president, at the National Cathedral in Washington, D.C.
'Distinguished guests, including our Presidents and First Ladies, government officials, foreign dignitaries, and friends: Jeb, Neil, Marvin, Doro, and I, and our families, thank you all for being here. At 90, George H. W. Bush parachuted out of an aircraft and landed on the grounds of St. Ann's by the Sea in Kennebunkport, Maine — the church where his mom was married and where he'd worshipped often. Mother liked to say he chose the location just in case the chute didn't open. To his very last days, dad's life was instructive. As he aged, he taught us how to grow old with dignity, humor, and kindness — and, when the Good Lord finally called, how to meet Him with courage and with joy in the promise of what lies ahead. Dad was always busy — a man in constant motion — but never too busy to share his love of life with those around him. He taught us to love the outdoors. He loved watching dogs flush a covey. He loved landing the elusive striper. And once confined to a wheelchair, he seemed happiest sitting in his favorite perch on the back porch at Walker's Point contemplating the majesty of the Atlantic. The horizons he saw were bright and hopeful. He was a genuinely optimistic man. And that optimism guided his children and made each of us believe that anything was possible. He loved to laugh, especially at himself. He could tease and needle, but never out of malice. He placed great value on a good joke. That's why he chose Simpson to speak. On email, he had a circle of friends with whom he shared or received the latest jokes. His grading system for the quality of the joke was classic George Bush. The rare 7s and 8s were considered huge winners — most of them off-color. He had an enormous capacity to give of himself. Many a person would tell you that dad became a mentor and a father figure in their life. He listened and he consoled. He was their friend. I think of Don Rhodes, Taylor Blanton, Jim Nantz, Arnold Schwarzenegger, and perhaps the unlikeliest of all, the man who defeated him, Bill Clinton. My siblings and I refer to the guys in this group as "brothers from other mothers." Well, dad — we're going remember you for exactly that and so much more. And we're going to miss you. Your decency, sincerity, and kind soul will stay with us forever. So, through our tears, let us see the blessings of knowing and loving you — a great and noble man, and the best father a son or daughter could have.